Agriculture - Welcome to Our Generation USA! 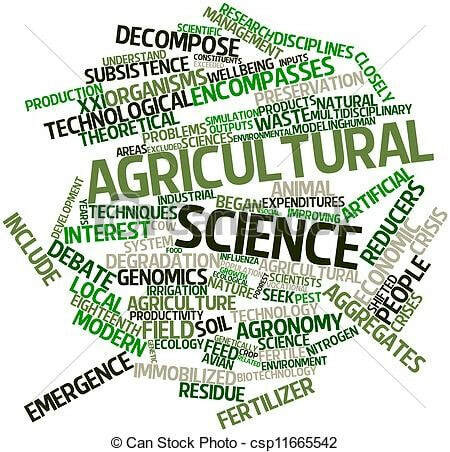 includes the farming of different crops, livestock, and dairy products in the United States, including government programs that support/regulate agriculture as well as the science of agriculture today. Agriculture in the United States including advancements in Agricultural Machinery used in farming, as well as Agricultural Commerce: from the farm to your local supermarket! ​Pictured: LEFT: Modern Farming Equipment: L-R: John Deere 7800 tractor with Houle slurry trailer, Case IH combine harvester, New Holland FX 25 forage harvester with corn head. RIGHT: Different Breeds of Dairy Cattle include Holstein, Jersey, Brown Swiss, Guernsey, Ayrshire, and Milking Shorthorn. Agriculture is a major industry in the United States, which is a net exporter of food. As of the 2007 census of agriculture, there were 2.2 million farms, covering an area of 922 million acres (3,730,000 km2), an average of 418 acres (1.69 km2) per farm. Although agricultural activity occurs in most states, it is particularly concentrated in the Great Plains, a vast expanse of flat, arable land in the center of the United States and in the region around the Great Lakes known as the Corn Belt. The United States has been a leader in seed improvement i.e. hybridization and in expanding uses for crops from the work of George Washington Carver to the development of bioplastics and biofuels. The mechanization of farming, intensive farming, has been a major theme in U.S. history, including John Deere's steel plow, Cyrus McCormick's mechanical reaper, Eli Whitney's cotton gin to the widespread success of the Fordson tractor and the combine harvesters first made from them. Modern agriculture in the U.S. ranges from the common hobby farms, small-scale producers to large commercial farming covering thousands of acres of cropland or rangeland. ​Agricultural equipment is any kind of machinery used on a farm to help with farming. The best-known example of this kind is the tractor. Agricultural Marketing: includes the services involved in moving agricultural product from the farm to the consumer. Numerous interconnected activities are involved in doing this, such as planning production, growing and harvesting, grading, packing, transport, storage, agro- and food processing, distribution, advertising and sale. Some definitions would even include “the acts of buying supplies, renting equipment, (and) paying labor", arguing that marketing is everything a business does. Such activities cannot take place without the exchange of information and are often heavily dependent on the availability of suitable finance. Marketing systems are dynamic; they are competitive and involve continuous change and improvement. Businesses that have lower costs, are more efficient, and can deliver quality products, are those that prosper. Those that have high costs, fail to adapt to changes in market demand and provide poorer quality are often forced out of business. Marketing has to be customer-oriented and has to provide the farmer, transporter, trader, processor, etc. with a profit. This requires those involved in marketing chains to understand buyer requirements, both in terms of product and business conditions. In Western countries considerable agricultural marketing support to farmers is often provided. In the USA, for example, the USDA operates the Agricultural Marketing Service. Support to developing countries with agricultural marketing development is carried out by various donor organizations and there is a trend for countries to develop their own Agricultural Marketing or Agribusiness units, often attached to ministries of agriculture. Activities include market information development, marketing extension, training in marketing and infrastructure development. Since the 1990s trends have seen the growing importance of supermarkets and a growing interest in contract farming, both of which impact significantly on the way in which marketing takes place. Approximately 80% of USDA's $140 billion budget goes to the Food and Nutrition Service (FNS) program. The largest component of the FNS budget is the Supplemental Nutrition Assistance Program (formerly known as the Food Stamp program), which is the cornerstone of USDA's nutrition assistance. The USDA also is concerned with assisting farmers and food producers with the sale of crops and food on both the domestic and world markets. It plays a role in overseas aid programs by providing surplus foods to developing countries. This aid can go through USAID, foreign governments, international bodies such as World Food Program, or approved nonprofits. The Agricultural Act of 1949, section 416 (b) and Agricultural Trade Development and Assistance Act of 1954, also known as Food for Peace, provides the legal basis of such actions. The USDA is a partner of the World Cocoa Foundation. ​The FDA was empowered by the United States Congress to enforce the Federal Food, Drug, and Cosmetic Act, which serves as the primary focus for the Agency; the FDA also enforces other laws, notably Section 361 of the Public Health Service Act and associated regulations, many of which are not directly related to food or drugs. These include regulating lasers, cellular phones, condoms and control of disease on products ranging from certain household pets to sperm donation for assisted reproduction. The FDA is led by the Commissioner of Food and Drugs, appointed by the President with the advice and consent of the Senate. The Commissioner reports to the Secretary of Health and Human Services. The FDA has its headquarters in unincorporated White Oak, Maryland. The agency also has 223 field offices and 13 laboratories located throughout the 50 states, the United States Virgin Islands, and Puerto Rico. In 2008, the FDA began to post employees to foreign countries, including China, India, Costa Rica, Chile, Belgium, and the United Kingdom. Click here for further amplification about the FDA. 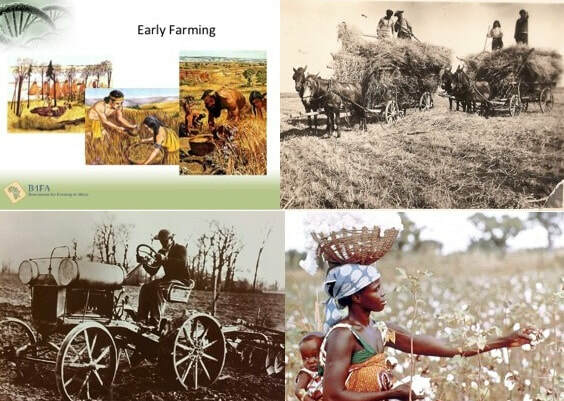 Pictured: Clockwise, from Upper Left: ancient farming techniques; horse-drawn farming; picking cotton by hand; and an early tractor used for plowing a field. Click here for historical timeline of agriculture and food technology. The history of agriculture covers the domestication of plants and animals and the development and dissemination of techniques for raising them productively. Agriculture began independently in different parts of the globe, and included a diverse range of taxa. At least eleven separate regions of the Old and New World were involved as independent centers of origin. Wild grains were collected and eaten from at least 20,000 BC. From around 9,500 BC, the eight Neolithic founder crops--emmer wheat, einkorn wheat, hulled barley, peas, lentils, bitter vetch, chick peas, and flax—were cultivated in the Levant. Rice was domesticated in China between 11,500 and 6,200 BC, followed by mung, soy and azuki beans. Pigs were domesticated in Mesopotamia around 13,000 BC, followed by sheep between 11,000 and 9,000 BC. Cattle were domesticated from the wild aurochs in the areas of modern Turkey and Pakistan around 8,500 BC. Sugarcane and some root vegetables were domesticated in New Guinea around 7,000 BC. Sorghum was domesticated in the Sahel region of Africa by 5,000 BC. In the Andes of South America, the potato was domesticated between 8,000 and 5,000 BC, along with beans, coca, llamas, alpacas, and guinea pigs. Bananas were cultivated and hybridized in the same period in Papua New Guinea. In Mesoamerica, wild teosinte was domesticated to maize by 4,000 BC. Cotton was domesticated in Peru by 3,600 BC. Camels were domesticated late, perhaps around 3,000 BC. In the Middle Ages, both in the Islamic world and in Europe, agriculture was transformed with improved techniques and the diffusion of crop plants, including the introduction of sugar, rice, cotton and fruit trees such as the orange to Europe by way of Al-Andalus. After 1492, the Columbian exchange brought New World crops such as maize, potatoes, sweet potatoes, and manioc to Europe, and Old World crops such as wheat, barley, rice, and turnips, and livestock including horses, cattle, sheep, and goats to the Americas. Irrigation, crop rotation, and fertilizers were introduced soon after the Neolithic Revolution and developed much further in the past 200 years, starting with the British Agricultural Revolution. Since 1900, agriculture in the developed nations, and to a lesser extent in the developing world, has seen large rises in productivity as human labor has been replaced by mechanization, and assisted by synthetic fertilizers, pesticides, and selective breeding. The Haber-Bosch process allowed the synthesis of ammonium nitrate fertilizer on an industrial scale, greatly increasing crop yields. Modern agriculture has raised social, political, and environmental issues including water pollution, biofuels, genetically modified organisms, tariffs and farm subsidies. In response, organic farming developed in the twentieth century as a consciously pesticide-free alternative. The American Farm Bureau Federation (AFBF), more commonly referred to as Farm Bureau (FB), is an independent, non-governmental, voluntary organization governed by and representing farm and ranch families united for the purpose of analyzing their problems and formulating action to achieve educational improvement, economic opportunity and social advancement and, thereby, to promote the national well-being. ​Farm Bureau is local, county, state, national and international in its scope and influence and is non-partisan, non-sectarian and non-secret in character. Farm Bureau is the voice of agricultural producers at all levels. AFBF is headquartered in Washington, D.C. There are 50 state affiliates and one in Puerto Rico. Policy is changing constantly, and it has a direct impact on farmers and ranchers. Having a voice – a seat at the table and an impact on policy – is critical. Beginning at the grassroots level and involving Farm Bureau members' advocacy efforts across the country, all of agriculture speaks with one voice through the American Farm Bureau Federation. The Foundation also builds relationships with educational institutions to introduce agricultural education tools and resources, and encourages adoption at the community, county, state, and national level. From its beginnings nearly a century ago, Farm Bureau has existed to give members the tools they need to succeed. That can mean financial expertise, communication skills, advocacy opportunities, training and opportunities to network with and learn from fellow farmers and ranchers. It all adds up to helping America's farmers and ranchers stay strong and prosperous. AFBF supported the Fighting Hunger Incentive Act of 2014 (H.R. 4719; 113th Congress), a bill that would amend the Internal Revenue Code to permanently extend and expand certain expired provisions that provided an enhanced tax deduction for businesses that donated their food inventory to charitable organizations. AFBF argued that without the tax write-off, "it is cheaper in most cases for these types of businesses to throw their food away than it is to donate the food". ​4-H is a global network of youth organizations whose mission is "engaging youth to reach their fullest potential while advancing the field of youth development". Its name is a reference to the occurrence of the initial letter H four times in the organization's original motto ‘head, heart, hands, and health’ which was later incorporated into the fuller pledge officially adopted in 1927. In the United States, the organization is administered by the National Institute of Food and Agriculture of the United States Department of Agriculture (USDA). 4-H Canada is an independent non-profit organization overseeing the operation of branches throughout Canada. Throughout the world, 4-H organizations exist in over 50 countries; the organization and administration varies from country to country. Each of these programs operates independently but cooperatively through international exchanges, global education programs, and communications. The 4-H name represents four personal development areas of focus for the organization: head, heart, hands, and health. As of 2016, the organization had nearly 6 million active participants and more than 25 million alumni. The 4-H motto is "To make the best better", while its slogan is "Learn by doing" (sometimes written as "Learn to do by doing"). The original pledge was written by Otis E. Hall of Kansas in 1918. Some California 4-H clubs add either "As a true 4-H member" or "As a loyal 4-H member" at the beginning of the pledge. Minnesota and Maine 4-H clubs add "for my family" to the last line of the pledge. Originally, the pledge ended in "and my country". In 1973, "and my world" was added. It is a common practice to involve hand motions to accompany these spoken words. While reciting the first line of the pledge, the speaker will point to their head with both of their hands. As the speaker recites the second line, they will place their right hand over their heart, much like during the Pledge of Allegiance. For the third line, the speaker will present their hands, palm side up, before them. For the fourth line, the speaker will motion to their body down their sides. And for the final line, the speaker will usually place their right hand out for club, left hand for community, bring them together for country, and then bring their hands upwards in a circle for world. The official 4-H emblem is a green four-leaf clover with a white H on each leaf standing for Head, Heart, Hands, and Health. The stem of the clover always points to the right. The idea of using the four-leaf clover as an emblem for the 4-H program is credited to Oscar Herman Benson (1875–1951) of Wright County Iowa. He awarded three-leaf and four-leaf clover pennants and pins for students' agricultural and domestic science exhibits at school fairs. The 4-H name and emblem have U.S. federal protection, under federal code 18 U.S.C. 707. This federal protection makes it a mark unto and of itself with protection that supersedes the limited authorities of both a trademark and a copyright. The Secretary of Agriculture is given responsibility and stewardship for the 4-H name and emblem, at the direct request of the U.S. Congress. These protections place the 4-H emblem in a unique category of protected emblems, along with the U.S. Presidential Seal, Red Cross, Smokey Bear and the Olympic rings. Through the program's tie to land-grant institutions of higher education, 4-H academic staff are responsible for advancing the field of youth development. Professional academic staff are committed to innovation, the creation of new knowledge, and the dissemination of new forms of program practice and research on topics like University of California's study of thriving in young people. Youth development research is undertaken in a variety of forms including program evaluation, applied research, and introduction of new programs. Volunteering has deep roots in American society. Over half of the American people will volunteer in some capacity during a year's time. It is estimated that 44% of adults (over 83.9 million people) will volunteer within a year. This volunteerism is valued at over $239 billion per year. These volunteers come from all different age groups, educational levels, backgrounds and socioeconomic statuses. Volunteer leaders play a major role in 4-H programs and are the heart and soul of 4-H. They perform a variety of roles, functions and tasks to coordinate the 4-H program at the county level and come from all walks of life, bringing varied and rich experiences to the 4-H program. With over 540,000 volunteers nationally, these leaders play an essential role in the delivery of 4-H programs and provide learning opportunities to promote positive youth development. Every year, volunteer leaders work to carry out 4-H youth development programs, project groups, camps, conferences, animal shows and many more 4-H related activities and events. 4-H volunteer leaders help youth to achieve greater self-confidence and self-responsibility, learn new skills and build relationships with others that will last a lifetime. Volunteers serve in many diverse roles. Some are project leaders who teach youth skills and knowledge in an area of interest. Others are unit or community club leaders who organize clubs meetings and other programs. ​Resource leaders are available to provide information and expertise. 4-H volunteers work under the direction of professional staff to plan and conduct activities and events, develop and maintain educational programs, and secure resources in support of the program. YouTube Video: What is an Agronomist? 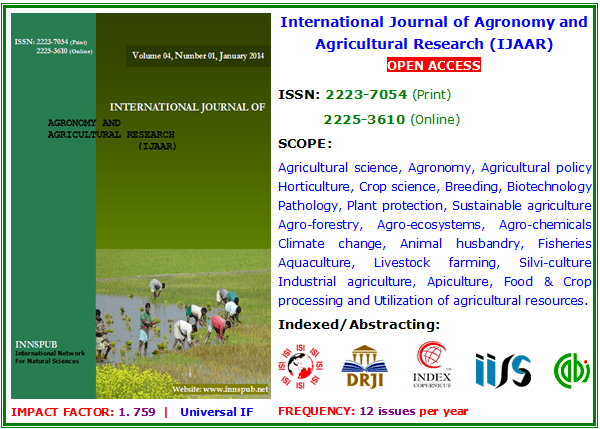 Pictured below: International Journal of Agronomy and Agricultural Research (IJAAR) publish high-quality original research papers together with review articles and short-communications. Agronomy has come to encompass work in the areas of plant genetics, plant physiology, meteorology, and soil science. It is the application of a combination of sciences like biology, chemistry, economics, ecology, earth science, and genetics. Agronomists of today are involved with many issues, including producing food, creating healthier food, managing the environmental impact of agriculture, and extracting energy from plants. Agronomists often specialize in areas such as crop rotation, irrigation and drainage, plant breeding, plant physiology, soil classification, soil fertility, weed control, and insect and pest control. An agronomist field sampling a trial plot of flax.This area of agronomy involves selective breeding of plants to produce the best crops under various conditions. Plant breeding has increased crop yields and has improved the nutritional value of numerous crops, including corn, soybeans, and wheat. It has also led to the development of new types of plants. For example, a hybrid grain called triticale was produced by crossbreeding rye and wheat. Triticale contains more usable protein than does either rye or wheat. Agronomy has also been instrumental in fruit and vegetable production research. Agronomists study sustainable ways to make soils more productive and profitable throughout the world. They classify soils and analyze them to determine whether they contain nutrients vital to plant growth. Common macronutrients analyzed include compounds of nitrogen, phosphorus, potassium, calcium, magnesium, and sulfur. Soil is also assessed for several micronutrients, like zinc and boron. The percentage of organic matter, soil pH, and nutrient holding capacity (cation exchange capacity) are tested in a regional laboratory. Agronomists will interpret these lab reports and make recommendations to balance soil nutrients for optimal plant growth. In addition, agronomists develop methods to preserve the soil and to decrease the effects of erosion by wind and water. For example, a technique called contour plowing may be used to prevent soil erosion and conserve rainfall. Researchers in agronomy also seek ways to use the soil more effectively in solving other problems. Such problems include the disposal of human and animal manure, water pollution, and pesticide build-up in the soil. As well as looking after the soil for future generations to come, such as the burning of paddocks after crop production. As well as pasture [management] Techniques include no-tilling crops, planting of soil-binding grasses along contours on steep slopes, and contour drains of depths up to 1 metre. Agroecology is the management of agricultural systems with an emphasis on ecological and environmental perspectives. This area is closely associated with work in the areas of sustainable agriculture, organic farming (next), and alternative food systems and the development of alternative cropping systems. YouTube Video: Is Organic Food Better for Your Health? Organic farming continues to be developed by various organic agriculture organizations today. It relies on fertilizers of organic origin such as compost manure, green manure, and bone meal and places emphasis on techniques such as crop rotation and companion planting. Biological pest control, mixed cropping and the fostering of insect predators are encouraged. In general, organic standards are designed to allow the use of naturally occurring substances while prohibiting or strictly limiting synthetic substances. For instance, naturally occurring pesticides such as pyrethrin and rotenone are permitted, while synthetic fertilizers and pesticides are generally prohibited. Synthetic substances that are allowed include, for example, copper sulfate, elemental sulfur and Ivermectin. Genetically modified organisms, nanomaterials, human sewage sludge, plant growth regulators, hormones, and antibiotic use in livestock husbandry are prohibited. Reasons for advocation of organic farming include advantages in sustainability, openness, self-sufficiency, autonomy/independence, health, food security, and food safety. Organic agricultural methods are internationally regulated and legally enforced by many nations, based in large part on the standards set by the International Federation of Organic Agriculture Movements (IFOAM), an international umbrella organization for organic farming organizations established in 1972. Organic agriculture can be defined as an integrated farming system that strives for sustainability, the enhancement of soil fertility and biological diversity whilst, with rare exceptions, prohibiting synthetic pesticides, antibiotics, synthetic fertilizers, genetically modified organisms, and growth hormones. Since 1990 the market for organic food and other products has grown rapidly, reaching $63 billion worldwide in 2012. This demand has driven a similar increase in organically managed farmland that grew from 2001 to 2011 at a compounding rate of 8.9% per annum. As of 2016, approximately 57,800,000 hectares (143,000,000 acres) worldwide were farmed organically, representing approximately 1.2 percent of total world farmland. YouTube Video: How can farming and renewable energy work together? While many rural communities have independently practiced eco-agriculture for thousands of years, over the past century many of these landscapes have given way to segregated land use patterns, with some areas employing intensive farming practices without regard to biodiversity impacts, and other areas fenced off completely for habitat or watershed protection. A new eco-agriculture movement is now gaining momentum to unite land managers and other stakeholders from diverse environments to find compatible ways to conserve biodiversity while also enhancing agricultural production. ​The term "eco-agriculture" was coined by Charles Walters, economist, author, editor, publisher, and founder of Acres Magazine in 1970 to unify under one umbrella the concepts of "ecological" and "economical" in the belief that unless agriculture was ecological it could not be economical. This belief became the motto of the magazine: "To be economical agriculture must be ecological." Eco-agriculture is both a conservation strategy and a rural development strategy. Eco-agriculture recognizes agricultural producers and communities as key stewards of ecosystems and biodiversity and enables them to play those roles effectively. Eco-agriculture applies an integrated ecosystem approach to agricultural landscapes to address all three pillars—conserving biodiversity, enhancing agricultural production, and improving livelihoods—drawing on diverse elements of production and conservation management systems. Meeting the goals of eco-agriculture usually requires collaboration or coordination between diverse stakeholders who are collectively responsible for managing key components of a landscape. Eco-agriculture uses the landscape as a unit of management. A landscape is a cluster of local ecosystems with a particular configuration of topography, vegetation, land use, and settlement. The goals of eco-agriculture—to maintain biodiversity and ecosystem services, manage agricultural production sustainably, and contribute to improved livelihoods among rural people—cannot be achieved at just a farm or plot level, but are linked at the landscape level. Therefore, to make an impact, all of the elements of a landscape as a whole must be considered; integrated landscape management is an approach that seeks to achieve this. ​Defining a landscape depends on the local context. Landscapes may be defined or delimited by natural, historical, and/or cultural processes, activities or values. Landscapes can incorporate many different features, but all of the various features have some influence or effect on each other. Landscapes can vary greatly in size, from the Congo Basin in west-central Africa where landscapes are often huge because there are vast stretches of apparently undifferentiated land, to western Europe where landscapes tend to be much smaller because of the wide diversity of topographies and land use activities occurring close to each other. Agriculture is the most dominant human influence on earth. Nearly one-third of the world’s land area is heavily influenced by cropland or planted pastures. An even greater area is being fallowed as part of an agricultural cycle or is in tree crops, livestock grazing systems, or production forestry. In addition, most of the world’s 100,000+ protected areas contain significant amounts of agricultural land. And over half of the most species-rich areas in the world contain large human populations whose livelihoods depend on farming, forestry, herding, or fisheries. Agriculture as it is often practiced today threatens wild plant and animal species and the natural ecosystem services upon which both humans and wildlife depend. Over 70% of the fresh water withdrawn by humans goes to irrigation for crops, causing a profound impact on the hydrological cycles of ecological systems. Moreover, fertilizers, pesticides, and agricultural waste threaten habitats and protected areas downstream. Land-clearing for agriculture also disrupts sources of food and shelter for wild biodiversity, and unsustainable fishing practices deplete freshwater and coastal fisheries. Additionally, an increase in the planting and marketing of monoculture crops across the globe has decreased diversity in agricultural products, to the extent that many local varieties of fruits, vegetables, and grains have now become extinct. Given that demands on global agricultural production are increasing, it is imperative that the management of agricultural landscapes be improved to both increase productivity and enhance biodiversity conservation. ​Wild biodiversity increasingly depends on agricultural producers to find ways to better protect habitats, and agriculture critically needs healthy and diverse ecosystems to sustain productivity. Traditionally there has existed a divide between conservationists, who want to set land aside for the protection of wild biodiversity, and agriculturalists, who want to use land for production. Because more than half of all plant and animal species exist principally outside protected areas –- mostly in agricultural landscapes –- there is a great need to close the gap between conservation efforts and agricultural production. For example, conservation of wetlands within agricultural landscapes is critical for wild bird populations. Such species require initiatives by and with farmers. Ecoagriculture provides a bridge for these two communities to come together. ​Farming communities play a vital role as managers of their ecosystems and biodiversity. As Ben Falk points out, they are often viewed as stewards. In his understanding, "Stewardship implies dominion, whereas partnership implies co[-]evolution; mutual respect; whole-archy, not hierarchy. A partner is sometimes a guide, always a facilitator, always a co[-]worker." Since a farmer's dependence on their land and natural resources necessitates a conservation ethic, their farm productivity critically demands their assistance in delivering a range of ecosystem services. Wild species often also play an important role in providing livestock fodder, fuel, veterinary medicines, soil nutrient supplements and construction materials to farmers, as well constituting an essential element of cultural, religious, and spiritual practices. The dominance of agriculture in global land use requires that eco-agriculture approaches be fostered by rural producers and their communities on a globally significant scale. To do this, farmers need to be able to conserve biodiversity more consistently in ways that benefit their livelihoods. Agricultural landscapes that aim to achieve the objectives of ecoagriculture –- enhanced biodiversity conservation, increased food production, and improved rural livelihoods –- should be managed in ways that protect and expand natural areas and improve wildlife habitats and ecosystem functions, in collaboration with local communities to insure their benefit. Link un-farmed areas, forest fragments, and wetlands within agricultural landscapes to develop habitat networks and corridors that support and expand the range of wild species. This approach is particularly useful to migratory species, which can include pollinators and natural enemies of agricultural pests. Many indigenous peoples and rural communities have developed, maintained, and adapted different types of ecoagriculture systems for centuries. Local farmers, pastoralists, fishers, forest users, and other community members are the foundation of rural land stewardship. Their knowledge, traditions, land use practices, and resource-management institutions are essential to the development of viable ecoagriculture systems for their landscapes. The mainstreaming of ecoagriculture approaches will be crucially dependent upon mobilizing local communities to become leaders in ecoagriculture, as teachers and as advocates for political and institutional change. Communities facing similar challenges can share questions, ideas, and solutions with each other. Local communities also need effective processes for sharing their expertise with national policymakers and the international community and thus play a more central role in settinge coagriculture objectives in policy and program development. The Millennium Development Goals (MDGs), eight ambitious targets which range from halving extreme poverty to halting the spread of HIV/AIDS and providing universal primary education, were put forth by the United Nations in 2000, to be achieved by 2015. Ecoagriculture strategies will be essential to achieving the MDGs, particularly for hunger and poverty, water and sanitation, and environmental sustainability. The MDGs will not be reached without securing the ability of the rural poor to feed their families and gain income, while at the same time protecting the biodiversity and ecosystem services that sustain their livelihoods. Of the estimated 800 million people who do not have access to sufficient food, half are smallholder farmers, one-fifth are rural landless, and one-tenth are principally dependent on rangelands, forests and fisheries. For most of them, reducing poverty and hunger will depend centrally on their ability to sustain and increase crop, livestock, forest, and fishery production. ​A key opportunity for enhancing progress towards the MDGs is investment in locally-driven land management approaches –- such as ecoagriculture strategies –- that build upon synergies between rural livelihoods, environmental sustainability, and food security. In fact, ‘ecoagriculture’ landscapes often feature many of these approaches. Ecoagriculture draws heavily on these and many other innovations in rural land use planning and management. Large scale: Ecoagriculture moves beyond the management of individual farms and/or protected areas to help detect and plan for interactions among different land uses at the landscape scale. In addition, important attributes such as wildlife population dynamics and watershed functions can be meaningfully understood only at the landscape scale. Also, in recognition of the fact that short-term trade-offs may lead to long-term synergies, ecoagriculture advocates conducting analyses over longer temporal scales than is commonly done. Emphasis on synergies: Eco-agriculture emphasizes both the need and the opportunity to foster synergies among conservation, agricultural production, and rural livelihoods. The ecoagriculture research and monitoring agenda seeks, in part, to identify and document these synergies. Emphasis on stakeholder collaboration: Eco-agriculture can not be achieved by individual land managers. The management of eco-agriculture landscapes requires processes that support a variety of land managers (within the landscape) with diverse environmental and socio-economic goals to collaboratively develop coordinated conservation and production management approaches that collectively achieve conservation, production, and livelihood goals at a landscape scale. Importance of both conservation and agricultural production: Building on the Millennium Ecosystem Assessment, eco-agriculture brings conservation fully into the agricultural and rural development discourse by highlighting the importance of ecosystem services in supporting continued agricultural production. Eco-agriculture also identifies the conservation of native biodiversity and ecosystems as an equally important goal in its own right. It also supports conservationists to more effectively conserve nature within and outside protected areas by working with the agricultural community and developing conservation-friendly livelihood strategies for rural land users. A crop is a plant or animal product that can be grown and harvested extensively for profit or subsistence. Crop may refer either to the harvested parts or to the harvest in a more refined state. Most crops are cultivated in agriculture or aquaculture. A crop is usually expanded to include macroscopic fungus (e.g. mushrooms), or algae (algaculture). Horticulture crops include plants used for other crops (e.g. fruit trees). Floriculture crops include bedding plants, houseplants, flowering garden and pot plants, cut cultivated greens, and cut flowers. Note that many of the globally apparently minor crops are regionally very important. For example in Africa, roots & tubers dominate with 421 kcal/person/day, and sorghum and millet contribute 135 kcal and 90 kcal, respectively. Intensive crop farming is a modern form of intensive farming that refers to the industrialized production of crops. Intensive crop farming's methods include innovation in agricultural machinery, farming methods, genetic engineering technology, techniques for achieving economies of scale in production, the creation of new markets for consumption, patent protection of genetic information, and global trade. These methods are widespread in developed nations. The practice of industrial agriculture is a relatively recent development in the history of agriculture, and the result of scientific discoveries and technological advances. Innovations in agriculture beginning in the late 19th century generally parallel developments in mass production in other industries that characterized the latter part of the Industrial Revolution. The identification of nitrogen and phosphorus as critical factors in plant growth led to the manufacture of synthetic fertilizers, making more intensive uses of farmland for crop production possible. Similarly, the discovery of vitamins and their role in animal nutrition, in the first two decades of the 20th century, led to vitamin supplements, which in the 1920s allowed certain livestock to be raised indoors, reducing their exposure to adverse natural elements. The discovery of antibiotics and vaccines facilitated raising livestock in larger numbers by reducing disease. Chemicals developed for use in World War II gave rise to synthetic pesticides. Developments in shipping networks and technology have made long-distance distribution of produce feasible. Critics of intensively farmed crops cite a wide range of concerns. On the food quality front, it is held by critics that quality is reduced when crops are bred and grown primarily for cosmetic and shipping characteristics. Environmentally, industrial farming of crops is claimed to be responsible for loss of biodiversity, degradation of soil quality, soil erosion, food toxicity (pesticide residues) and pollution (through agrichemical build-ups and runoff, and use of fossil fuels for agrichemical manufacture and for farm machinery and long-distance distribution).